Habit: Subshrub, shrub, < 50 dm, hairy, generally silver (+- green). Stem: decumbent to erect. Leaf: cauline, clustered near base or not, hairy; stipules 6--20 mm; petiole 1--8 cm; leaflets 6--10, 10--45 mm. Inflorescence: 4--30 cm, flowers generally not to loosely whorled; peduncle 5--13 cm; pedicels 3--10 mm; bract 4--15 mm. Flower: 9--16 mm; calyx upper lip 6--8 mm, deeply divided, lower 6--10 mm, entire to 3-toothed; petals violet to lavender, banner back generally hairy, spot generally yellow (to white) turning purple, keel generally unlobed near base, upper margins generally ciliate middle to tip, lower glabrous. Fruit: 3--5 cm, hairy. Seed: 4--9, 4--6 mm, mottled tan. Note: Variable, +- indistinct from Lupinus excubitus. Lupinus albifrons var. douglasii (J. Agardh) C.P. Sm. Habit: Shrub 10--20 dm, generally silver-silky. Stem: erect. Leaf: stipules 10--20 mm; petiole 1--4 cm; leaflets 7--9, 25--45 mm. 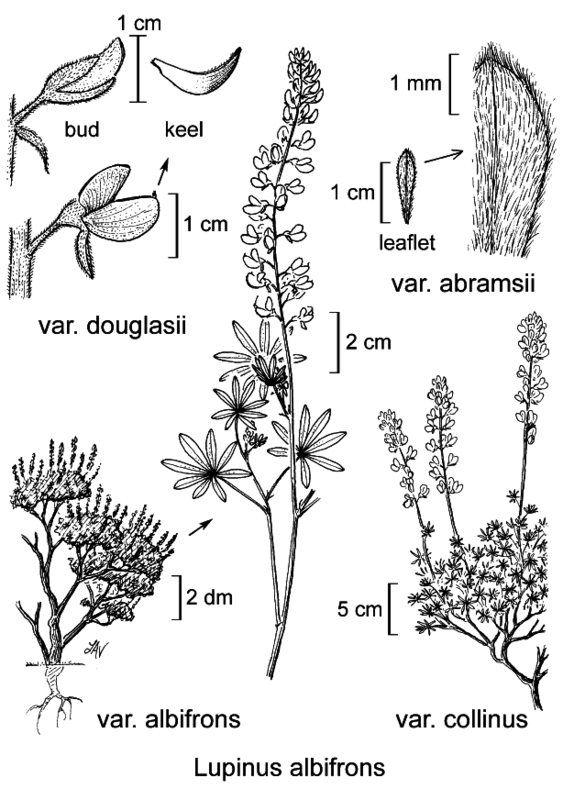 Inflorescence: 10--15 cm; peduncle 9--10 cm; pedicels 6--10 mm; bract 10--24 mm. Flower: banner back sparsely hairy. Citation for this treatment: Teresa Sholars & Rhonda Riggins 2012, Lupinus albifrons var. douglasii, in Jepson Flora Project (eds.) Jepson eFlora, http://ucjeps.berkeley.edu/eflora/eflora_display.php?tid=61190, accessed on April 19, 2019. CCo, nw SnFrB, s SCoRO, ChI, w WTR. Markers link to CCH specimen records. Yellow markers indicate records that may provide evidence for eFlora range revision or may have georeferencing or identification issues. Purple markers indicate specimens collected from a garden, greenhouse, or other non-wild location.